So, your friend asked you to be her bridesmaid. You happily said yes, wanting nothing more than to show your love and support for her on what will be one of the biggest days of her life. Being the great friend you are, you'd like to be the best bridesmaid ever. So, what do you do? How do you help to make her wedding day enjoyable? What are the little things that will be the most important? Here are a few tips to help you. Step one: Don't step on her veil. Kidding... but not really. It all starts with the dress. The hardest part of the bridesmaid gig can sometimes be the dress. You know, that bridesmaid dress you never in a million years, for any reason would have ever chosen to put on your body. That dress is not only something you wouldn't have chosen, but it's also something you'll be paying for. Maybe even paying a lot. What do you do? You should roll with it. Be easy to get along with during the dress-picking phase. Imagine you have six bridesmaids, all of whom are the women who are nearest and dearest to you. You love these women, and you want them to look fabulous. You'd also like your wedding to look fabulous, too. The process can be a nightmare if every one of these women insists that a dress be chosen according to their style and budget preferences. If you're asked for your input, then gladly give it. Otherwise, roll with what's presented to you. You'll be so appreciated. Participate. Be a great friend. Ask her if she needs you to make phone calls or to coordinate with vendors. Ask if you can throw her an invitation-writing party. See if they need help with out of town guests. There are a million things on her to-do list. Take some of the pressure off her and her soon-to-be spouse by eliminating a couple of those items. It doesn't matter what stage of planning their in, there is something you can help with. And if she can't think of a single thing she'd like you to do, tell her you'll be over next week to go over everything that needs done. Sometimes just having someone else know what needs to happen who is willing to help make it happen down the road can be such a huge help. The wedding day is the last day of a long process. For most brides, the wedding day is the culminating moment of a very long process (remember all the planning we just talked about?). 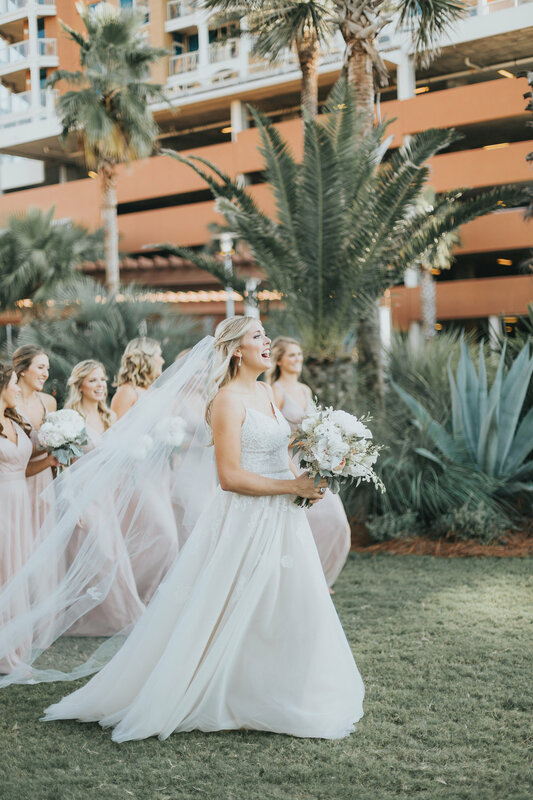 With popular event spaces and venues booking about a year in advance for weddings, the wedding day is often the big event at the end of a year+ runway. Imagine the amount of planning that takes. The coordination of all the moving parts to create a beautiful event. Well, if the bride and groom in your life isn't working with an event coordinator (and even if they are), then buy them a bottle of their favorite beverage. They deserve it. Also, remember your part in all of this. Wedding shower, bachelorette party—whatever it is that you're responsible for, be responsible for it. Make sure it's planned well in advance of the wedding. Make sure the invitations are sent early enough so guests have time to buy a gift and make arrangements to attend. Ask the bride if she has any preferences, but then take over so following up on the planning doesn't become one more thing on her to-do list. Don't drop the ball on the shower or the party. And don't drop the stress involved with planning either on the doorstep of the bride. If the other bridesmaids are being a pain, don't let the bride know. Let her waltz in to her shower or party with no knowledge of the amount of effort you put in to make it happen because it it's all about her. You're going to be asked for your opinion about something, or maybe many things. Be mindful of your answer. Be honest, but frame your response to account for the bride and groom's current state of mind. The bride and groom are up to their eyeballs in decisions and choices, and what might seem to be a trivial thing could be very important to them. Even the most even-tempered people can be brought to tears due to wedding jitters or the stress of planning the whole thing. Be happy for your friends. Show it with your enthusiasm. Your friend will always remember how helpful and supportive you were. Make it a point to write them a card or letter to let them know how happy you are for their engagement and how honored you are that you were chosen to be a part of their big day. Are you the maid of honor? If so, be prepared to give a great toast for the newlyweds. I'm sure you can find lots of toast ideas on Google or Pinterest, but don't panic. Remember who your audience really is. It isn't the crowd. It's the bride and groom. Make it personal and special. Let them know how happy you are for them and that you're so glad they're embarking on a journey together. I know that sounds trivial, but making sure the bride and groom both have their most basic needs met will make everything go more smoothly. Also, people love to bring the newlyweds drinks and shots, but they rarely think of water. Water will help with all of the drinks and shots that are getting pushed their direction. If you'll be getting ready with the bride before the wedding, bring snacks. Encourage her to eat it. And, eat one yourself. If you can, bring enough for everyone. Once the ceremony is over, next comes lots of pictures, and hangry is a real thing (you know, angry because you're hungry). Nothing can make a bridal party cranky faster than hunger. And if I can offer one last tip it's to keep your eyes and ears open. There are always problems, unforeseen issues that pop up at the last minute. If it's a problem you can handle without bothering the bride or groom, then do it. Try to give them space to be calm and peaceful as they prepare to make such a commitment to each other.